Editorials EARLY ANDROGEN DEPRIVATION FOR PROSTATE CANCER? Disclosure Of Financial Relationships • Institutional: Under a licensing agreement between Cell Genesys Inc. and the Johns Hopkins University, the University is entitled to milestone payments and royalties on the sale of immunotherapy products. The terms of this arrangement are being managed by the Johns Hopkins University in accordance with its conflict of interest policies. • Personal: Cell Genesys Inc. has agreed to provide salary support for a translational research fellow in the Drake laboratory. Overview Three Major Immunotherapy Technologies Under Development: – Ex-vivo pulsed dendritic cells – Viral vectors – GM-CSF transduced tumor cells • Ongoing Trials • The Future …..
• Whole cells modified to secrete cytokines or express receptors Data on file, Cell Genesys Inc. Dranoff et al. Proc Natl Acad Sci. 1993;90:3539. Levitsky et al. J Immunol. 1996;156:3858. GM-CSF = granulocyte-macrophage colony-stimulating factor. • malaise (16%) • myalgia (11%). Data on file, Cell Genesys, Inc.
Tannock et al. N Engl J Med. 2004;351:1502. *Patients treated on q21d schedule for docetaxel; †High-dose group only; ‡Median OS expected to meet or exceed 29.1 months based on patients still in follow-up. SWOG = Southwest Oncology Group. Petrylak et al. N Engl J Med. 2004;351:1513; Small et al. ASCO Prostate, 2006. Abstract 254. Updated from poster presentation; Tannock et al. N Engl J Med. 2004;351:1502. • Trial open and enrolling patients !!! *GVAX immunotherapy administered as 1 priming dose of 5 × 108 cells followed by boosting doses of 3 × 108 cells q14d × 12, then q28d. At: http://www.clinicaltrials.gov/ct/show/NCT00089856. Accessed May 2006.
doses of 3 × 108 cells q21d × 9, then as immunotherapy alone q28d. At: http://www.clinicaltrials.gov/ct/show/NCT00133224. Accessed May 2006. Conclusions • Immunotherapy for prostate cancer may soon be a treatment option • Several competing technologies with relative advantages / disadvantages • Important ongoing phase III trials – Enrollment of minority patients? 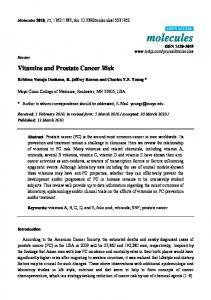 Report "Immunotherapy for Prostate Cancer: Progress and Status"